A carefully researched exploration of our history, ‘Dunfanaghy’s Presbyterian Congregation and Its Times’ (PDF, 3.8Mb), a retrospect, was published in May 1978 by Colan MacArthur MA. Records mention a Presbyterian community and Minister in 1679. However, the Scots Plantations in the area of Dunfanaghy date from around 1610/1611 and “Presbyterian” clergy were in the Raphoe diocese before 1622. The first Meeting House was built on a site opposite the present Market Square in the town. 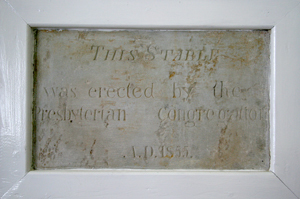 This was rebuilt in 1750 as shown by the stone now built into the back wall of the present church. In 1814, a new Meeting House was built at Derryart. The remains of this meeting house which was demolished in 1876 can still be seen by the path close to the boundary wall of Ards Forest Park. This is opposite the roadside farm house a short distance after the main Ards entrance as you travel in the direction of Dunfanaghy. Over the years, there is evidence of important contributions to the Community through innovations in Agriculture, Fisheries and the development of other local businesses, cooperation and aid in times of need, and positive involvement in all aspects of the life of the area. When the present church was opened in October 1878. the attraction of Dunfanaghy to visitors was already a factor in the congregation’s thinking and the contribution both to attendance and in support of the Church continues to be of immense value. Summer attendances are often close to capacity and in recent years very good attendances are welcomed at Dunfanaghy all year round. In addition to this website, a new development to assist is the invitation to those who would wish to make a special gesture of support by becoming an Associate Member of the congregation. Details are to be found in the pews, by contacting any member, or by using the Associate Member link.